As Bluefish developer I’m not really tightly involved with gnome and gtk development. However, it is our platform, and although we ship OSX and Windows binaries, most of our users are on Linux, many of them using Gnome. We are as much affected by a gtk bug than any other gnome part. So if we find any, we try to contribute. However, for some reason it feels that our “outside” contributions are not so welcome. I believe this is not intentional, but still this is not a good thing. So what makes me feel that these contributions are not so welcome? The lack of feedback and results. An example: In 2012-09-05 I filed a bugreport https://bugzilla.gnome.org/show_bug.cgi?id=683388 with a patch to improve the GList documentation. I noticed that new developers often make trivial mistakes (for example appending in a loop). I got some feedback and reworked the patch, submitted on 2012-09-12. And then nothing happened anymore. For 1 year and 4 months there was a total silence. I was originally planning to work trough all of the glib documentation to make it easier for novice programmers to work with, but this result was not really motivating me to do any more work on glib. Until on 2014-01-20 the bug was closed with “fixed”. A tiny bit of documentation was added, but the majority of the patch was not committed. Perhaps it was considered low quality, but at least tell the contributer! And tell how to improve it! A second example: Early this year a reproducible way to crash Bluefish was reported. 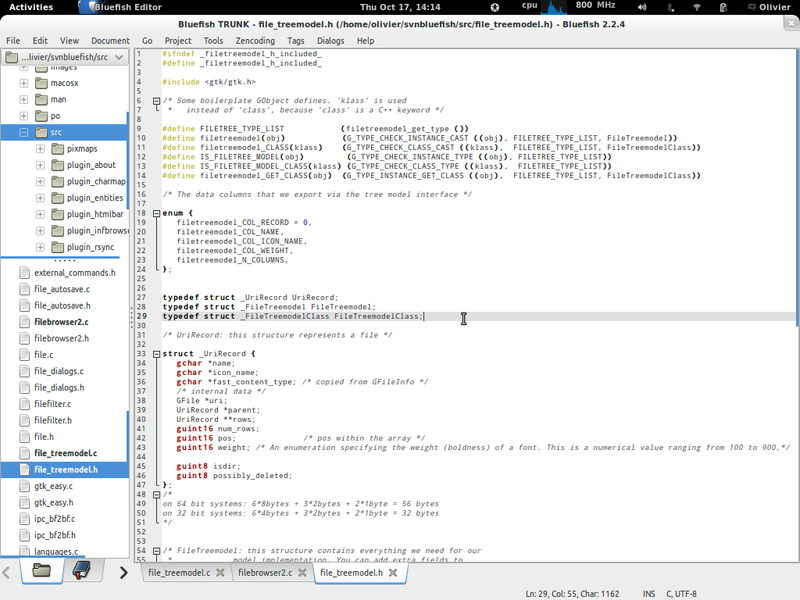 We realized the bug was not in Bluefish but in Gtk, GtkTreeModelFilter to be more specific. Instead of just filing a bugreport with the problem, we tracked down the problem and found how to fix it, and filed that in bugzilla https://bugzilla.gnome.org/show_bug.cgi?id=722058 For us this is a critical bug. It makes Bluefish crash. It’s now three months later, and nothing has happened. I’m afraid that the next major gtk release will still have this bug, and Bluefish will remain a crappy application because it crashes because of this bug in gtk. We should improve this! This is not the way to attract new developers! On the contrary, this does discourage new developers! End note: I realize that I am not heavily involved with gtk or gnome. So there might be many valid reasons why the above two examples are completely wrong. Perhaps my complete feeling about the feedback and results is wrong. Perhaps my expectations are completely unrealistic. But if I have this feeling, there might be more occasional contributing developers that have this feeling. So we could at least then try to explain the true situation. End note 2: I’m not a native English writer. So if my language was blunt or rude in any way to any person: this was really not intentional and I apologize. I don’t want to attack anyone. I don’t want to complain. I just want to send a signal that we can do better and should do better. Today I had the weirdest debugging session ever. A bug https://bugzilla.gnome.org/show_bug.cgi?id=704108 was reported that I could reproduce on Fedora 19, but not on Fedora 18, not on OSX, not on Ubuntu 12.04 (tried both 32bits and 64bits), and not on Ubuntu 13.10.
what I found: j not only loops from 0 to 127, but continues far beyond that number!?!? The function character_is_symbol() is a simple array lookup. but although j reached values of 10000, this assertion was never reached???? I am still completely baffled by this bug. How is this possible? Does this have to do with loop vectorization? Is this a bug in gcc? Is this a bug in my code? What is going on? edit: thanks for your comments. It most likely was a combination of a 1-over array size (undefined) with the aggressive loop optimization that the latest gcc has (which then seems to remove the condition in the loop). Problem solved, code fix in svn! 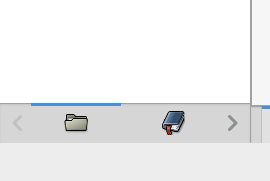 The file tree in Bluefish shows icons for the files. To do so, it has an “icon name” column in the tree model, using the special feature of the cell_renderer_pixbuf to render icons by name. The column COL_ICON_NAME just contains the name (as string) of the icon. Currently, the icon name is retrieved from a GIcon. The GIcon is retrieved by asking for the property “standard::icon” in g_file_enumerate_children_async(). This means that, for every file, the code creates a GIcon object, just to get a string with the icon name. From browsing trough the glib and gio code I understand that the GIcon is searched for using the mime type, with a binary search in an array that defines all the icons. This needs only one copy of the icon name in memory. In the treestore we can have a pointer to the string in the hash table. Currently 500 text files have 500 copies of the string “text-plain” in memory. But does this have disdvantages? Any ideas / comments ? First thing I did was modifying the tutorial code from a listmodel to a treemodel. Therefore each record has a pointer “parent”, and each record should store it’s children. One of the design decisions was how to store children: as a linked list, or an array of records, or an array of pointers to records. Some thoughts: The linked list is faster if you have to insert an entry somewhere in the middle, or remove one (with an array this requires realloc()). The array is faster if you need the nth element (with a linked list you need to traverse the list). The array also brings another advantage: use qsort for sorting (but the g_list_ functions have a good sort function for lists as well), and bsearch for searching if an entry exists (a linked list requires again to traverse all entries to see if an entry exists). An array of records needs more memory copying during sort, insert or delete. An array of pointers needs more memory (one extra pointer for each record). In a file tree, most directories have the same files for most of the times. Sometimes a new file is added, or a file is deleted, but most of the time the list is stable. So I chose the array of pointers. But I’m still doubting if I should have chosen an array of records. The file browser pane in Bluefish shows icons, and can show a name in bold or normal weight. The compare function for sorting returns directories before files, so I need to know if a record is a directory or a file. Bluefish also has filtering possibilities based on filename or mime type. So these properties are all added to each record. Because I chose an array of pointers, it is costly to find the next item in the array from a record. Therefore I added the position in the array as property. The next one is simply pos+1. This has another advantage: after sorting, the TreeModel needs to inform all listerers that the order has changed. For that you need the old and the new order. Since the old order is stored in pos this is easily done in a loop over the array. In the Bluefish code I oten need to convert from a GFile to a position in the TreeModel and vice versa. I therefore added a hash table to the treemodel with the GFile as key and the record as value. Since a GFile is refcounted, It takes only a pointer to add it to the record as well. At last I need a way to refresh directories when I re-read them. I could simply delete them all, and add them again, but that would also delete the sub-directories. So I added a “possibly_deleted” property that is set to 1 before directory re-read, and set to “0” if an entry still exists. After closing the directory every record that still has “possibly_deleted” set to 1 can be removed. To reduce memory usage, I changed several properties to 16bit or 8bit values. This requires an extra shift when accessing the properties, but with many records it reduces memory usage. These are the properties that are only needed when the records change (and directories are usually pretty stable). On 64 bit systems this results in: 6*8bytes + 3*2bytes + 2*1byte = 56 bytes per record. On 32 bit systems this results in : 6*4bytes + 3*2bytes + 2*1byte = 32 bytes per record. More about this code in a few days. Any comments how this design could be improved? Please post a comment.